The Stampotique Designers challenge is asking for sequins. 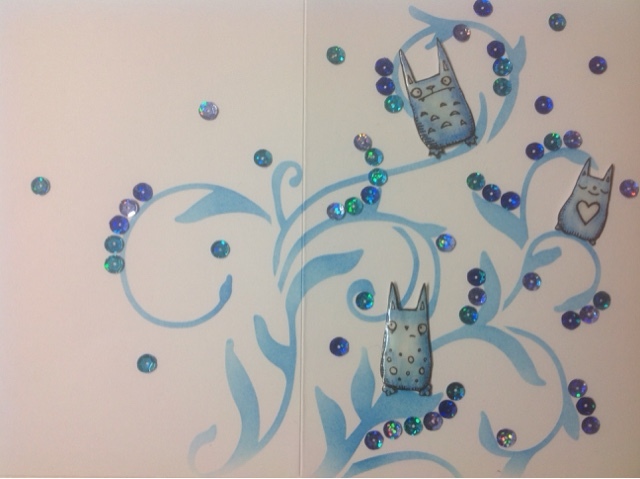 I'm joining in the fun with this card featuring little critters from the Line Up stamp. I searched my stash and found blue sequins in three different shades. 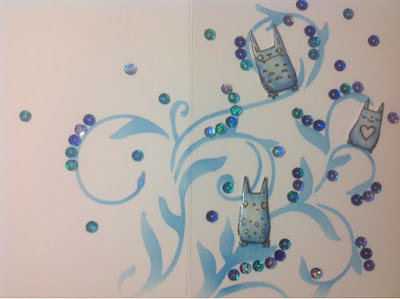 My first idea was to use a swirly stencil just to place the sequins on the card base. 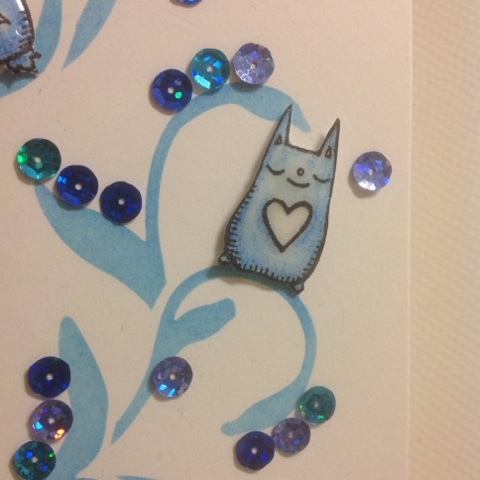 I ended up using Distress Ink first (with an ink blending tool) and deciding the sequins would be placed around the stenciled image. 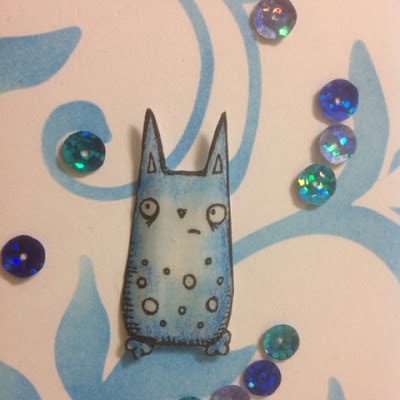 I stamped the Lineup, coloured the three smallest critters in blue and added glossy accents. Once that was dry, I fussy cut the images (a bit sorry about loosing the whiskers!) and perched them on the branches. 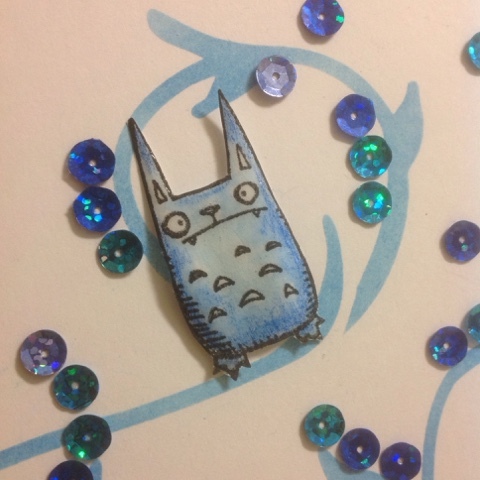 I glued the sequins with Glossy Accents. No idea if they will stand mailing, but I do love the way the image continues also to the back of the card. The stencil is from Donna Downey. So sparkly!!! This guys sure look like they are having fun on those branches! 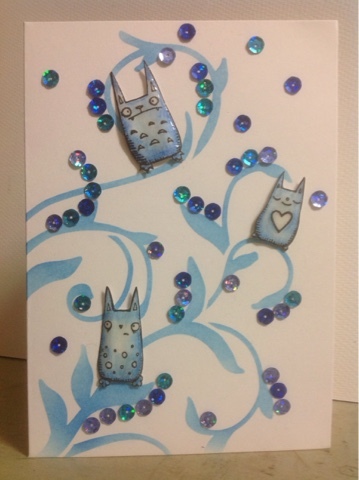 Thank you so much for joining us this week for the Stampotique Designer's Challenge. I love this wonderful card! This is lovely ! Thanks for joining us over at Stampotique ! Beautiful mash up of stamps and also sequins. Thanks for joining us at Stampotique this month. This is so sweet -- love the blue! This is wonderful and we thank you for joining us at Stampotique, however I have had to delete this entry due to the fact that it wasn't submitted with the challenge number attached. PLEASE resubmit in the next few days with the challenge number.